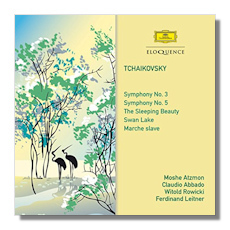 The prize item here for collectors within Australian Eloquence's hodgepodge of a Tchaikovsky cycle is the first release on CD of Mosche Atzmon's "Polish" Symphony with the Vienna Symphony. Deutsche Grammophon had limited success with the Vienna Symphony, producing scrappy and disengaged recordings under both Karajan and Fricsay. However, although most of us can agree that – then and now – the city's Philharmonic was the superior orchestra, under the right conditions it could still play magnificently. Giulini was one conductor who could marshal these forces, and apparently Mosche Atzmon was another. Along with the Abbado Fifth, this second entry of the cycle builds upon the excellence of the first. Frankly, the "Polish" is my least favorite of the Tchaikovsky canon, and I'm including "Manfred" in that discussion. Despite typically beautiful writing, I find the work short on both tunes and pathos. Nevertheless, this rare recording argues the piece effectively. I find the woodwind playing to be lovely, and Atzmon coaxes unusual polish from these strings. Fleet tempos and a steady hand minimizes the dead spots and brings out the melodies. The finale strikes me as somewhat droopy, but I'm inclined to blame the composer for that problem. The fillers on the first disc are a dull Marche Slav under the ever-boring Ferdinand Leitner, and a better – but slightly shaky Sleeping Beauty suite.